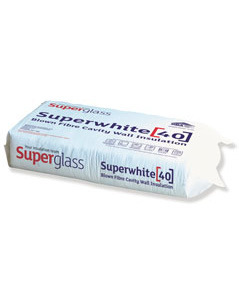 Superglass Superwhite 34 is a high performance, non-combustible and British Board of Agrément (BBA) approved glass mineral wool blown cavity wall insulation. Superwhite 34 has a 25 year guarantee and is inspected under the BBA Surveillance Scheme for cavity wall insulation. 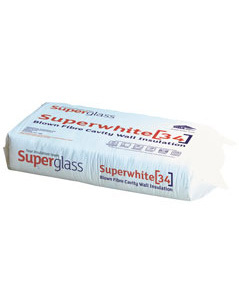 Superglass Superwhite 34 is designed to provide thermal insulation for new-build masonry cavity walls with a minimum cavity width of 90mm and up to 12m in height. It can be installed in buildings of 12m – 25m in height subject to a satisfactory inspection of the wall construction and installation approval by Superglass Insulation..
Superglass Superwhite 34 is BBA approved for all UK exposure zones (subject to conditions detailed in the BBA Certificate and NHBC Standards) and can also be installed in masonry party/separating walls as detailed within the Robust Details Handbook. Superglass Superwhite 34 is installed after the walls are built, from inside the building. It’s installed quickly and easily in any weather using existing machinery by a national network of Superglass and BBA approved installers. – 0.034W/mK, the best thermal conductivity available in the UK for a blown glass mineral wool cavity wall insulation product. – Can be installed in any weather conditions from inside the building. For an installed density of 25kg/m³ the following coverage should be obtained per bale. Thermal conductivity of 0.034W/mK when tested to BS EN 14064- 1: 2010 (Lambda 90/90). 0.034W/mK is the best thermal conductivity available in the UK for a blown glass mineral wool cavity wall insulation product. Tests by the BBA confirm that Superwhite 34 will not transmit water to the inner leaf. Please refer to the BBA certificate for more information.